"That sounds like the kind of deadlines I have to keep." 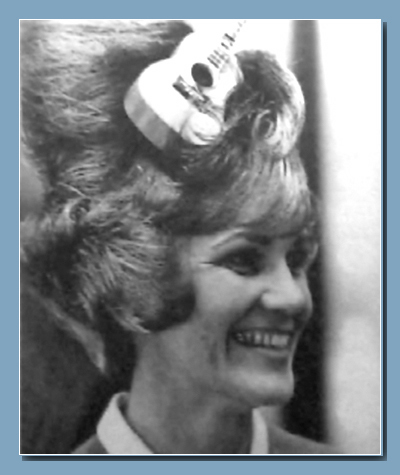 Laughed Dianne, youngest daughter of Billy, and this month's "Woman Behind the Man" - Ruth Grammer, as Music City News roving reporter slithered along the snow covered roads and buffalo trails to Chigger Dell Acres. It was eleven pm and just a few short hours before press time, but Ruth's welcome was as warm and friendly as always, as we laughed about the cause of the "rush situation" - my bout with chicken pox, picked up from Faron and Hilda Young's children, while doing last months story. Following this, had come to Nashville on one of the worst week's weather in the town's history, during which the Grammer farm had been isolated. "Until tonight our water had been frozen," laughed Ruth, "and have you ever tried melting snow in a bucket?" 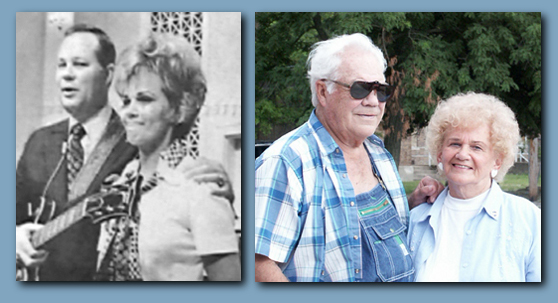 Ruth and Billy both hail from southern Illinois and have known each other since childhood. "I remember how he used to play at pie suppers," she told me. We'd have them in little one-room grade schools, and all the girls would take pies which would be auctioned off and bid for by their boy friends. The other boys would run up the price of course, and some pies would fetch as much as two dollars. "I actually met Billy in my junior year," Ruth recalled. "He had come to our school to perform and play guitar. Both the boys and girls were each putting on a play that day, and I had to remain on stage to pull the curtain while Billy was performing." "Well," she laughed, "the other boys sat there and made eyes at me all night and Billy just acted like he never saw me, but when he went home, he told his mother all about me, then sat down and wrote me a letter." "He was very bashful, and in the note asked me to date him, but at the time I wasn't dating." The following year found them in school together, Billy still asking, and Ruth still refusing, on the grounds that she was too young to date and that her mother, in any case, wouldn't let her go. "Then," says Ruth, "one day he came out to the house, and just hung around until Momma said, If your'e going anyplace you'd better be going." "I was from a big family, just like he was," she related. "I was from a family of twelve and Billy from a family of thirteen. We lived in the country and my parents had a small farm of 18 acres on which we raised fruit and vegetables. As a freshman, I walked four miles to school everyday. Once it was ten below zero and I just about froze to death. There never was a bus service but I had a perfect attendance medal for four years." It was during the war that Ruth, at sixteen, graduated from high school. Turning down a scholarship to enter college, she took a job that was waiting for her in Washington, DC, 900 miles away. "The only reason," Ruth commented "that my mother let me go was because one of my brothers was stationed there in the Navy, and he promised to 'take care' of me. I had a room in the home of a woman we called 'Mom' and there were about thirteen of us girls living there. We just had a ball, and I remember how, whenever the phone would ring, we'd all rush out of our rooms, lean over the banister rail and shout - is it for me? Is it for me?" 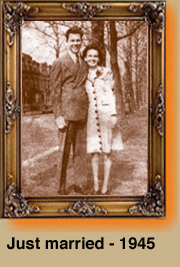 During this time Billy was in the Army, and "before he left," Ruth smiled, "he bought me an engagement ring, but I wouldn't take it because at sixteen I knew I was too young." 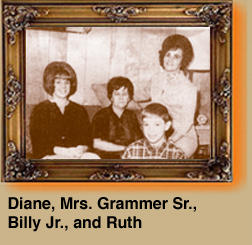 "So she carried it around for a year" added Mrs. Grammer Sr., Billy's mother, who was seated in an armchair reminiscing with us. "I told Billy that if I take the ring, you'll just want to get married right away, and he said no, he wouldn't, but then sure enough, when I did take it, the following June, we were married by October in the little country church back home. Back then, neither Ruth nor Billy had any ideas about getting into the music business. 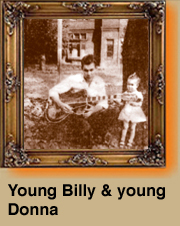 Both Billy and his father were good musicians, though neither one performed professionally. "We were married three years," Ruth claims, "before he went into the business. After he got out of the Army, he came to DC and got a job at the Naval Gun Factory as a machinist toolmaker. He was making $24 a week, but even on that we were never in need of anything. Out of a four hundred class, My Bill was tops in math," she bragged, "he was real smart." He'd get off work at midnight and I'd go to work in the early morning, so if I got to see him it was at midnight, and," she added, "he courted me in overalls!" Having once made the decision, "getting married" was the only problem for Billy and Ruth. "We got our blood tests in DC," she tells, "we didn't even have a car, we had to ride the train to Illinois. We had written the preacher that we wanted him to perform the ceremony, but had no idea whether or not he'd be there. We got home after dark, went to the County Clerk's house after getting my mother and Billy's mother to sign the papers, (she was 20 miles out) got the County Clerk out of bed, and went to the Courthouse to take out a license. The next afternoon, the preacher showed up and we were married. That was 21 years ago," Ruth added, "and I've always said I'll never get married again." After the wedding, the Grammer's went back to Washington, DC where they lived in a small apartment. The following September, their first child, Donna, was born. Following her birth, Billy was laid off at the gun factory and moved the family back to Illinois, where the only work was down in the coal mines. 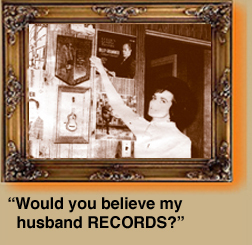 "I wouldn't consider him doing that," says Ruth, "but then a lucky break came when some visiting friends told us that Connie B. Gaye was in DC looking for talent for his radio show." They took a couple of demo records Billy had recorded with them, "and the next thing I knew, he was on a train heading back to Washington. He started working for Connie on WARL in Arlington. VA., and on the Showboat that Connie had out on the Potomac River." This was the beginning of a long and successful career for Billy during which Ruth has never - failingly been at his side. During the years that followed, they worked and lived in towns all around the United States. "The two girls," she tells, "were born in Washington, DC, and little Billy in Phoenix, Arizona." 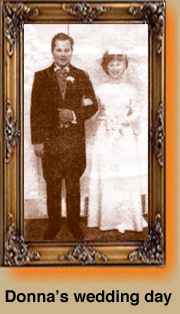 Donna is now 20 and was recently married on December 18th, and has the distinction of making the 'Who's Who in American Colleges and Universities'. Dianne is 18, and a senior in high school, a cheerleader, and the feature editor on the school paper. Billy Jr. is 13 and in the seventh grade in junior high. "He plays the trumpet" Ruth proudly told me. I wanted one horn in this family and now I've got it. 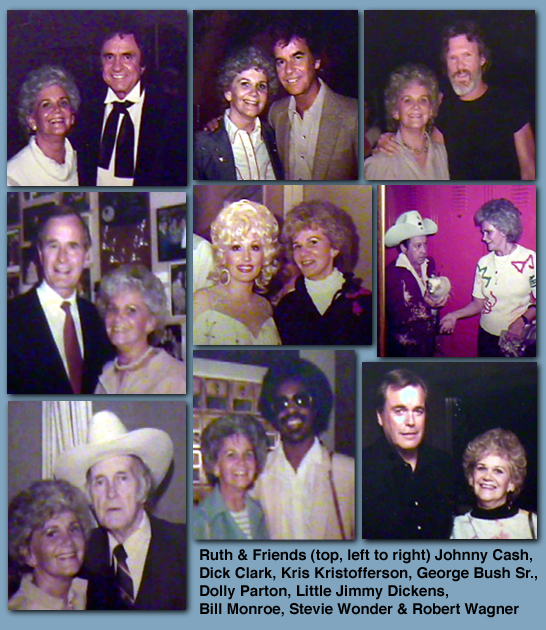 Billy put him on the Ralph Emery TV Show one morning," she added, "and he was real good!" "The only reason we left Connie B. Gaye," Ruth says, "is because Billy had a serious sinus problem, and would get strep throat constantly. He went to all kinds of specialists until one finally told him that we would have to go west. Well, we got as far as Illinois and found out that his Dad had Leukemia, and was not expected to live, so we stayed around a while, but you know, Billy's Dad knew why we were there, and he said, 'You kids had better go on where you're going!' Billy was awfully sick, so we took him out west and we had roughly $200, 2 children, and we didn't know one soul in Phoenix where we were going, but we piled up all we owned into the car and took off. When we got there, we rented a four-room house, and we were lucky because it was winter and the rent wasn't high. Billy checked the paper and the first night we were there, went out and saw a man who owned a big dance hall, played guitar for him, and was hired on the spot for $75 a night to play at dances. "Company comes to visit us, and especially in the summer, there is never a day goes by when someone doesn't come in. My son in law had courted my daughter for a year, and the other day he said to me, 'Mrs. Grammer, do you know this is the first weekend I've been here that you haven't had any out of town company?' "
Usually, when Billy goes out on a long trip, Ruth will buy a stack of material and make clothes for the girls, and is presently busy on a suit for Billy's mother. The last time he came in off the road he hardly recognized the kitchen which Ruth had remodeled during his absence. In addition to all these activities, she takes care of the fan mail, correspondence for the new Grammer Guitar factory, and does all her own washing, ironing, cooking and cleaning. "I was raised that way," she says, "and I guess I'll never be any different." One cannot tell Ruth Grammer's story without including the fact that she bowls. "Mary Reeves sponsors and bowls on our team," she says enthusiastically, "and I want you to see our new outfits. We honestly have the sharpest outfits in Nashville. Every year we have a new one, and we get complimented wherever we go, especially when we go out of town on tournaments. And, incidentally, we're going to the National in New Orleans, in May." 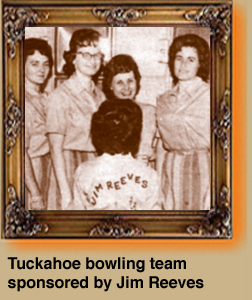 The "Tuckahoe" team was first sponsored by Jim Reeves and since its formation has been very successful. 'We are in first place with our Friday night team," she told me. "Out of eighteen teams, we are first, though its quite a struggle to stay there." Ruth Grammer is a happy woman and it is a happiness which springs from the sense of security and love that prevails in the their home. She is a thankful woman, thankful for this happiness and thankful for the good that came out of what some people would consider to be the bad times. "When Donna was born and Billy was making only $29 a week, there was always enough to eat, and plenty of happiness to go around, and even during our very hardest times," Ruth continued. "In 1949, when Billy was a guitar player in Wheeling, West Virginia for Hawkshaw Hawkins, I'd do needlework to help out, and even then, we didn't owe anybody. We were never in debt and you know, I was telling my son in law, when we went to the grocery store yesterday, most women know the price of all the groceries, but I don't know the price of a loaf of bread, and this is because I have always been able to go and pick up whatever we need. Even when we had our hard times, we ate well and I've never had to 'pinch' where food is concerned." 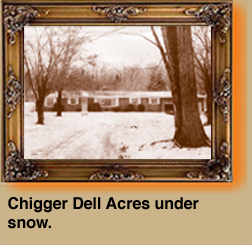 When I left Chigger Dell Acres at 2:00 am, it was with the same feeling that I have as this article draws to a close . . . one can never quite have one's fill of Ruth. Like her talented husband - star of the Grand Ole Opry, she always leaves you wanting to hear just a little bit more.